Four years ago, public pressure was critical to preventing a massive U.S. bombing campaign in Syria. But the U.S. government continued arming fighters, bombing on a smaller scale, and resisting opportunities for peace. Now Popular-Vote Loser Trump has sent more troops into Syria and yet more into a position of readiness in Kuwait. Please sign and share this urgent petition, which we will use in pushing back, step by step, to finally end this madness. We urge you to immediately pass the Stop Arming Terrorists Act (HR 608 / S 532) to prohibit giving U.S. public funds to Al Qaeda, ISIS, other terrorist groups, or any governments engaged in funding those groups. We urge you to immediately pass the Prohibit Expansion of U.S. Combat Troops into Syria Act (HR 1473 / Senate bill needed) to prohibit the deployment of U.S. troops or U.S.-funded mercenaries to Syria. 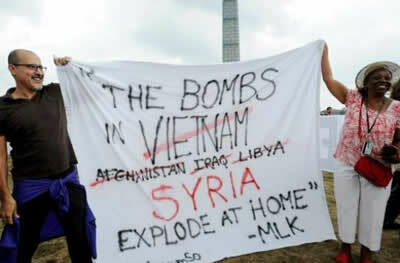 And, because bombs and missiles are the deadliest of U.S. weapons, the greatest creators of refugee crises, and a predictable prelude to escalated ground wars, we urge you to exercise your responsibility under the U.S. Constitution and forbid, under threat of impeachment, the spending of an additional dime on any participation in this undeclared war. Instead, we urge you to immediately pass legislation funding aid to refugees who have fled and who remain in Syria, banning the export of U.S.-made weapons to the Middle East, supporting a Middle Eastern WMD-free zone, and endorsing and committing to sharing the cost of an independent truth and reconciliation commission for Syria. 8441 1 year ago Anonymous QC PLEASE STOP THIS WAR IN SYRIA. STOP KILLING PEOPLE . 8437 1 year ago Jane Stillwater Berkeley, CA They're lying to us AGAIN. America, stop being suckered in again.